Azerbaijan, is situated at the crossroads of Eastern Europe and Western Asia, it is bounded by caspian sea to the east, Russia on north, Georgia in northwest, Armenia in west and Iran to the south.Azerbaijani cuisine has been influenced by the foods of different cultures, though at the same time, it remained distinctive and unique. Many foods that are indigenous to the country can now be seen in the cuisines of other neighboring cultures. For the Azerbaijanis, food is an important part of the country's culture and is deeply rooted in the history, traditions and values of the nation.The main course of Azerbaijani cuisine are over 30 kinds of soups, including those prepared from plain yogurt. One of the most reputed dishes of Azerbaijani cuisine, however, is plov from saffron-covered rice, served with various herbs and greens, a combination totally distinctive from Uzbek plovs. Azerbaijani cuisine includes more than 40 different plov recipes. Other second courses include a wide variety of kebabs and shashlik, including lamb, beef, chicken, and fish (baliq) kebabs. Dried fruits and walnuts are used in many dishes. The traditional condiments are salt, black pepper, sumac, and especially saffron, which is grown domestically on the Absheron Peninsula.Black tea is the national beverage, and is drunk after food is eaten. It is also offered to guests as a gesture of welcome, often accompanied by fruit preserves. From today onwards, i'll running a month of blogging marathon with Around the world in 30days as theme, everyday you will be served with different cuisine from today that too in alphabetic order. Yes we are making different International cuisine in alphabets, thats mean today is our first day and hence am posting a dish from Azerbaijan. Hope now you can get an idea about this mega blogging marathon theme. Coming to today's dish, this dish is very simple to make, you can have this aubergines rounds with tomatoes simply as starter or else you can serve them with bread or rice. If you want to change your usual way of making an eggplant dish, this dish is for you.However this dish takes hardly very less time to get ready. I picked this dish from here.I served this Azerbaijani aubergines hot with rice, with a mild garlicky flavour along with the mild tanginess of tomatoes, this dish is definitely a keeper. Slice the aubergines lengthwise. Salt the slices and set aside for 2 to 3 hours to allow the salt to bring out any bitter juices. Rinse the aubergines well and pat dry with kitchen paper. Drop the tomatoes in boiling water for a couple of minutes, then remove the skins. Heat a pan, chop the tomatoes and add it. Allow the tomato juice to evaporate, then add a little vegetable oil and fry for 5 minutes. Add salt and pepper. Fry the aubergines separately until cooked through, add salt and pepper during cooking. Remove the aubergines from the pan and place on kitchen paper to absorb excess oil. Crush the garlic and add to the cooked tomato. Put the cooked aubergine slices on a serving plate, add the tomato and garlic mixture and sprinkle chopped coriander on top. Serve with fresh bread or with rice. Thats a fantastic way to serve eggplants!! Great one to start the world tour, Priya! Such and easy recipe and a good one to start the mega bm. I am glad you chose a country and cuisine that is not so popular, at least in the US. You have presented a simple dish so beautifully. OMG..can't believe this..we make the brinjals in the same fashion..just that we add onions too..wow . cuisine from .non popular country..love the clicks and the country choice. 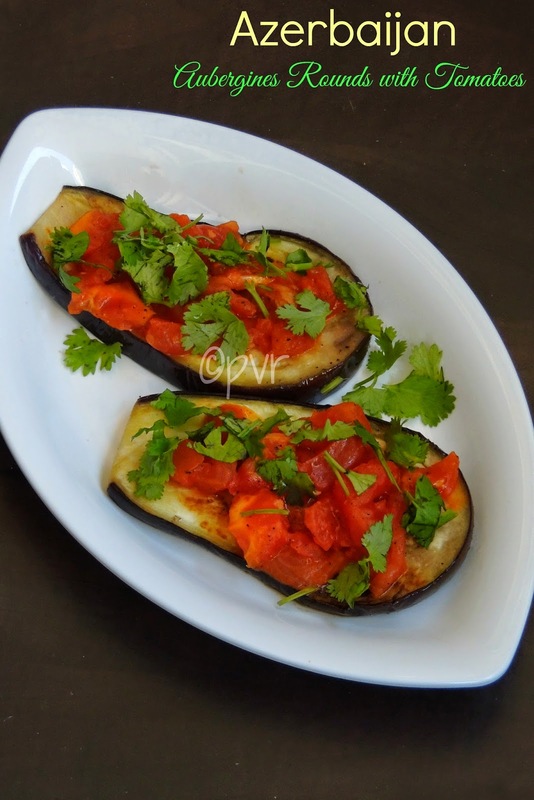 What a yummy and simple eggplant dish. Sounds awesome. Looking forward to ur posts in this series this month Priya. Priya, great job and a wonderful choice..I won't have even read about this country if not for this post..great start! and eggplant looks so cool.. Delicious and lovely looking eggplant preparation. What a beautiful eggplant dish! Eggplants looks fabulous , never heard about this country . Nice way to start the marathon. And history of that country was interesting too ! 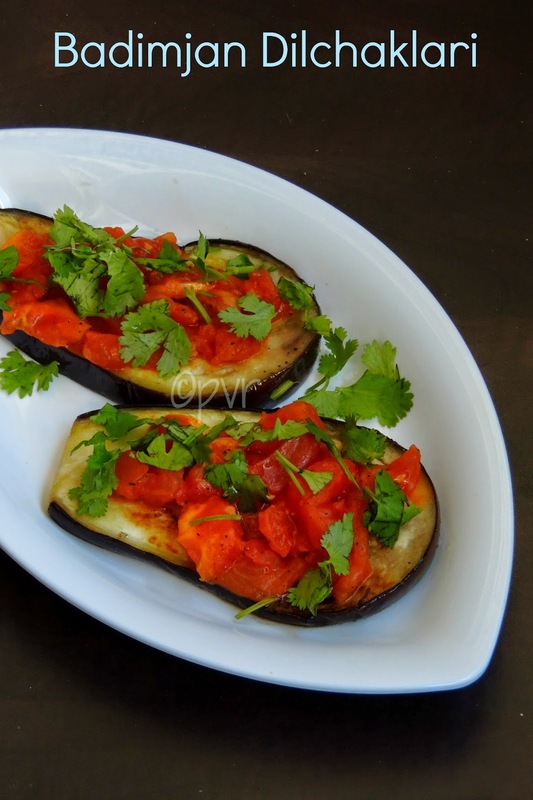 I wanted to try this but some how pulled my self to Algeria, lokks so delicious..
wow super aks , starting leye pinnurel :) such an fantastic recipe choice , love the topping on the aubergine :) Wonderful clicks !! Nice pics.. simple and delicious recipe.. Simple and flavorful dish, nice presentation Priya..
Lovely dish. Simple yet inviting. Very nice Priya. I love aubergines and this way of serving is simple yet flavourful..